After about 1910 some pressed blanks were made with molds that contained elements of the pattern to be cut. They should be called pressed-patterned blanks to distinguish them from “figured” blanks (which were blown, of course, not pressed) and from pressed-unpatterned (that is, plain) blanks. Wilson (1994, p. 690) mentions their use at the Libbey Glass Company as characteristic of “post-Rich Cut glass,” that is, post-Brilliant Period cut glass. He also quotes a statement that appeared in the 6 Feb 1904 issue of China, Glass, and Lampsas follows: “The Libbey Company is experimenting with pressed blanks on an extensive scale.” Unfortunately it is not clear whether these pressed blanks were plain or patterned. Nappy cut and engraved in the Wistaria pattern. From the 1920 Libbey catalog: “A combination of polished rock crystal effect vine and leaf work with copper wheel engraved birds and sprays of Wistaria blooms. 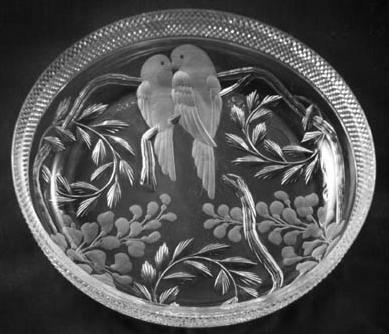 The cockatoo, or love bird, ornament follows a timely decorative tendency for birds. A wide silver diamond cut band fittingly frames this attractive pattern.” Shape no. 219. Signed Libbey (in circle). D = 8″ (20 cm), H = 1.75″ (4.4 cm), wt = 2 lb (0.9 kg). Retail price $7 in 1920. Sold for $275 in 1982.